Hello friends, hope your enjoying the start to the weekend. On December 7th, my great-niece blessed our family with the delivery of twin girls. big brother, who by the way will be two in February. So here it is. 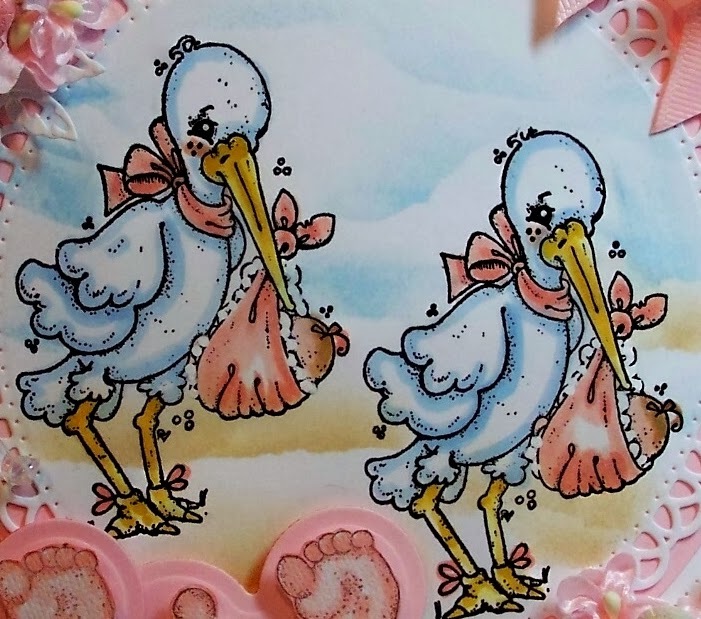 The storks and footprints are both by Magnolia Rubber Stamps! The lettering is a Cuddlebug emboss and cut folder of the Alphabet. The hearts are Spelllbinder's dies. A closup of these sweet storks, making their very special delivery. We can't wait until these babies can come home. OMG Sue...this card is TRULY MAGNIFICENT!!! Twins...what fun!! So now you're a Great Great Auntie!!! I have twin Granddaughters who are now SIX...the blessing that they are is AWESOME!! But back to your card...I have always loved this special stork...I love your cloud background and well just everything about this card!!!! SPECIAL WISHES for the speedy home coming of these two PRECIOUS bundles!! Hi Sue, how wonderful, twin girls, what a start to a new year. Congratulations to you all. oo this is gorgeous Sue ans twins wow congratulations with your family members. Oh this is such a special card! I love the image and love how you added those little embossed letters! Congratulations on the arrival of the new babies!!!!! congrats with these two girls. so nice to hear that they are doing well. you made a perfect card for them. Sue, you just can't get any prettier that this card. I love the way you incorporated two of everything. They will treasure this for a lifetime. Twins, what fun!!! Oh you will have a ball with these girls. 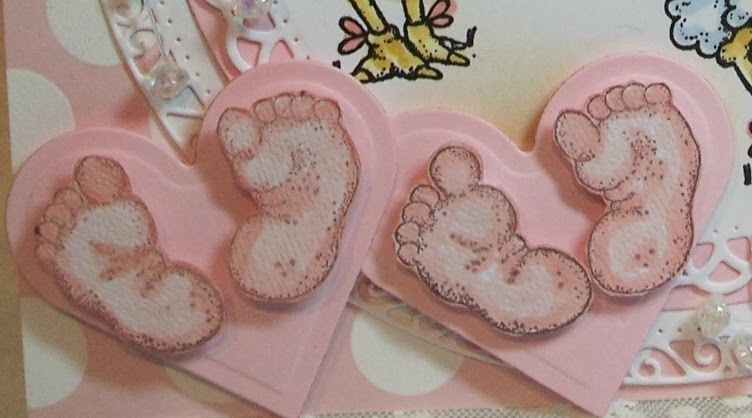 Awwww congrats to your great-niece on the birth of her twins. I a pleased to hear how well they are doing. Your card is truly beautiful Sue. I love the image and all your detailing is just amazing. A card to be treasured for sure. This is gorgeous. 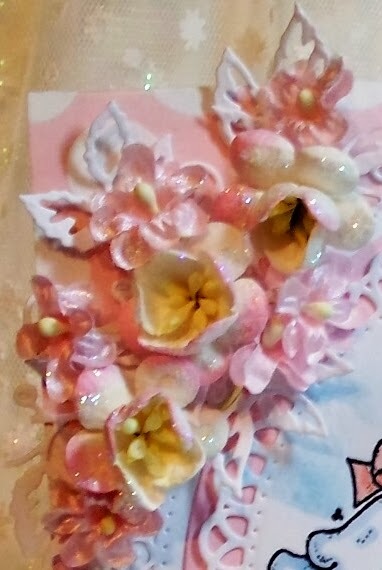 I love the embossed letters in the circles, the fat little footprints (AWWW) on the hearts, the flowers and your beautiful coloring. I sure hope your niece will have some help when these babies get home. Three babies - ouch under 2..... God knew what he was doing when he made Mothers young! Beautiful card! Your design is fabulous. 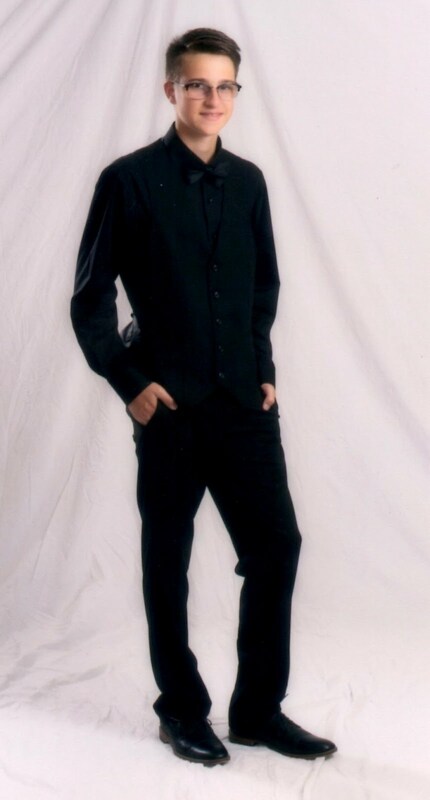 Thanks for joining us at 7KidsCollegeFund.com. 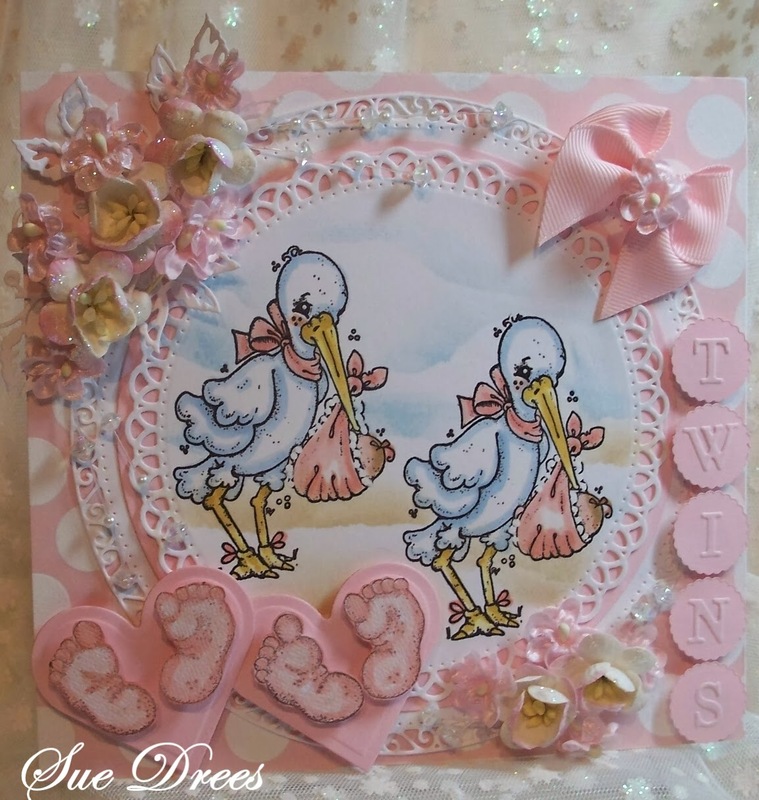 Awesome baby card, adore the image and your fabulous design!